What Musical Instruments Were Used in Biblical Times? Music and musical instruments were used in Biblical times just as they are today to praise, worship and even soothe the soul. 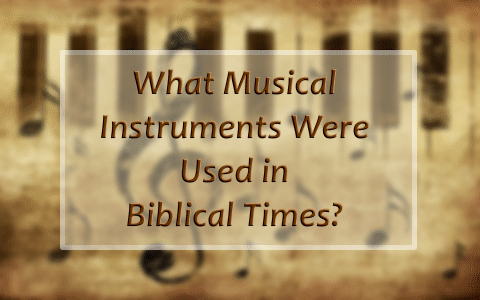 So, what musical instruments were used in Biblical times? Do we still have the same name for these instruments today? Some of the instruments mentioned in the Bible that we may not recognize include the tabrets and timbrels which are very much like the modern-day tambourine. Also mentioned only one time in the Bible is the sackbut – much like the trombone. And then there is the psaltery which might resemble a dulcimer where the strings are plucked rather than struck with a hammer. And I imagine that the viol is much like a violin that was held vertically and played with a bow – like a cello. Joshua 6:4 And seven priests shall bear before the ark seven trumpets of rams’ horns: and the seventh day ye shall compass the city seven times, and the priests shall blow with the trumpets. Ezekiel 33:3–4 If when he seeth the sword come upon the land, he blow the trumpet, and warn the people; Then whosoever heareth the sound of the trumpet, and taketh not warning; if the sword come, and take him away, his blood shall be upon his own head. 2 Chronicles 29:25 And he set the Levites in the house of the LORD with cymbals, with psalteries, and with harps, according to the commandment of David, and of Gad the king’s seer, and Nathan the prophet: for so was the commandment of the LORD by his prophets. 1 Kings 10:12 And the king made of the almug trees pillars for the house of the LORD, and for the king’s house, harps also and psalteries for singers: there came no such almug trees, nor were seen unto this day. Daniel 3:5 That at what time ye hear the sound of the cornet, flute, harp, sackbut, psaltery, dulcimer, and all kinds of musick, ye fall down and worship the golden image that Nebuchadnezzar the king hath set up. 1 Kings 1:38–40 So Zadok the priest, and Nathan the prophet, and Benaiah the son of Jehoiada, and the Cherethites, and the Pelethites, went down, and caused Solomon to ride upon king David’s mule, and brought him to Gihon. And Zadok the priest took an horn of oil out of the tabernacle, and anointed Solomon. And they blew the trumpet; and all the people said, God save king Solomon. And all the people came up after him, and the people piped with pipes, and rejoiced with great joy, so that the earth rent with the sound of them. You don’t have to look far to see that the Bible includes a whole orchestra of instruments. Today, some have different names and may even look slightly unlike the instruments of old. But just like today, in Biblical times, they were used not only as a means to warn people, but as “instruments” of rejoicing, praise and worship. Read more about music here: What Does the Bible Say About Music? Previous post: What Is The Acts of Paul and Thecla?